Author: Evans, Richard J. Set In . . .
Adroitly blending narrative, description, and analysis, Richard J. Evans portrays a society rushing headlong to self-destruction and taking much of Europe with it. Interweaving a broad narrative of the war's progress from a wide range of people, Evans reveals the dynamics of a society plunged into war at every level. The great battles and events of the conflict are here, but just as telling is Evans's re- creation of the daily experience of ordinary Germans in wartime. At the center of the book is the Nazi extermi­nation of the Jews. 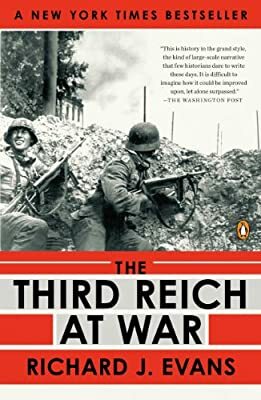 The final book in Richard J. Evan's three-volume history of Hitler's Germany, hailed "a masterpiece" by The New York Times, The Third Reich at War lays bare the most momentous and tragic years of the Nazi regime.